Watch this space for more info about Chicago Zine Fest 2018! Quimby’s is proud to co-sponsor The Chicago Zine Fest, a celebration of small press and independent publishers, with free workshops, events, and an annual festival. CZF 2018 will be held May 18-19. All events are free! Friday, May 18th: Panel Discussion & Exhibitor Reading, 6:30-9:30pm at the Institute of Cultural Affairs, 4750 N. Sheridan Road in Uptown. The topic is On Speaking Terms: Zines, Librarians and Communities and the panel will feature local zinester and Chicago Public Library employee Oscar Arreola, Doro of the School of the Art Institute’s Zine Collection, Milo from Queer Zine Archive Project (QZAP), and moderated by the University of Chicago’s zine archivist, Sarah G. Wenzel. Then stay for the exhibitor reading featuring performances by Zach Auburn, Shira Mario, Megan Metzger, Ariel Chan, Marian Runk, Katie Armentrout and Cathy Hannah. Facebook event invite for that event here. Saturday, May 19th: Tabling Exhibition, 11am-6pm at The Plumbers Union Hall, 1340 W Washington Blvd in Chicago. The exhibitor list is here. And Facebook event invite for that event here. Come see us at Table S3! 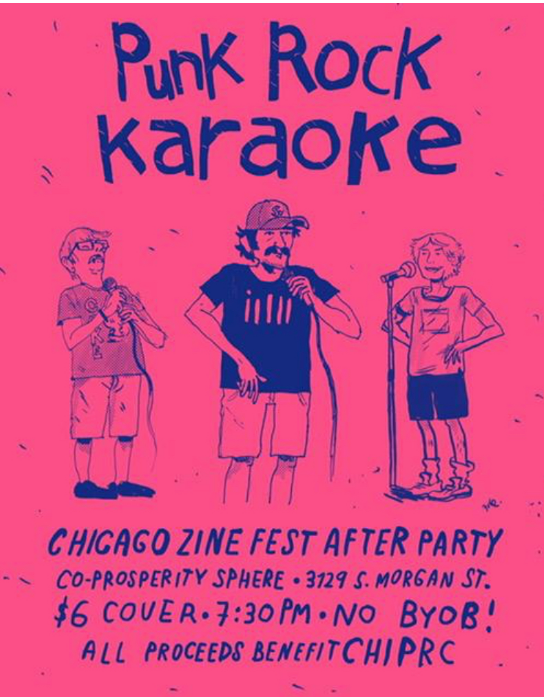 And don’t forget about the Chicago Zine Fest Afterparty w/ Punk Rock Karaoke at the Co-Prosperity Sphere from 7:30 to midnight on Saturday night. (Here’s the Facebook event invite for it.) $6 goes to fundraiser for the CHIPRC. PRK flyer by Miguel Centeno. Interested in volunteering? Contact CZF here! CZF 2018 artwork by Yewon Kwon. Tags: Chicago Zine Fest, Co-Pro, Co-Prosperity Sphere, CPS, CZF, Institute of Cultural Affairs, Plumbers’ Union Hall, zines. 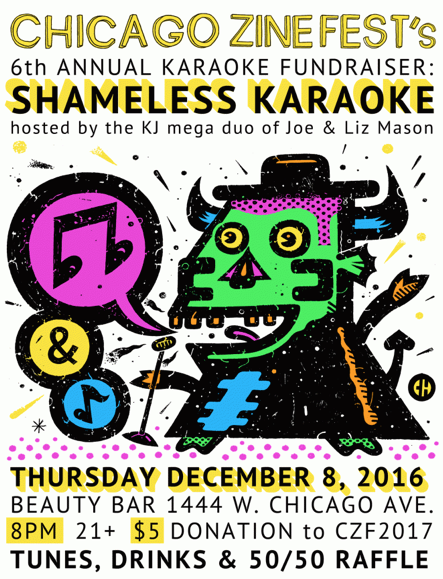 Calling all Karaoke Idols, you can stop singing to yourself while driving to work and join Chicago Zine Fest at our annual karaoke fundraiser, Thursday, December 8th at Beauty Bar, 1444 W Chicago Ave. NOT at QUIMBY’S. Hosted by Joe and Liz Mason of Shameless Karaoke, dig deep into their songbook of over 3000 songs (w/ 100 new ones just added for you to try out!). They’ve got tons of artists from classics to contemporary from the like of David Bowie, Neil Diamond, Katy Perry, Michael Jackson, No Doubt, Madonna, Prince, Rolling Stones, Miley Cyrus, Britney Spears and “more more more” (yes Billy Idol too). There is a $5 admission which will benefit the 2017 Chicago Zine Fest. Beauty Bar offers their signature martini and a manicure drink special! Plus walk away with some extra cash by entering the CZF Split the Pot raffle. Now all that’s left is you and some friends (can’t sing duets alone). The event beings at 8pm and is 21+. Get on stage and rock out! 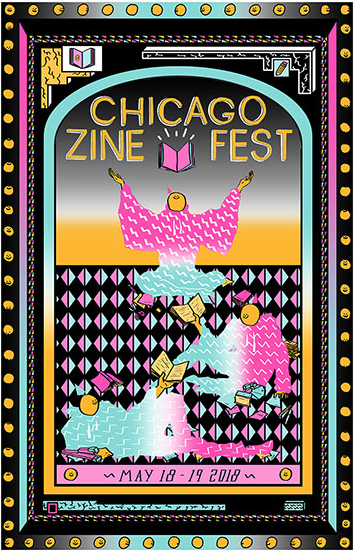 About Chicago Zine Fest: The Chicago Zine Fest is an independent event creating an outlet for small press and independent publishers to showcase their work. 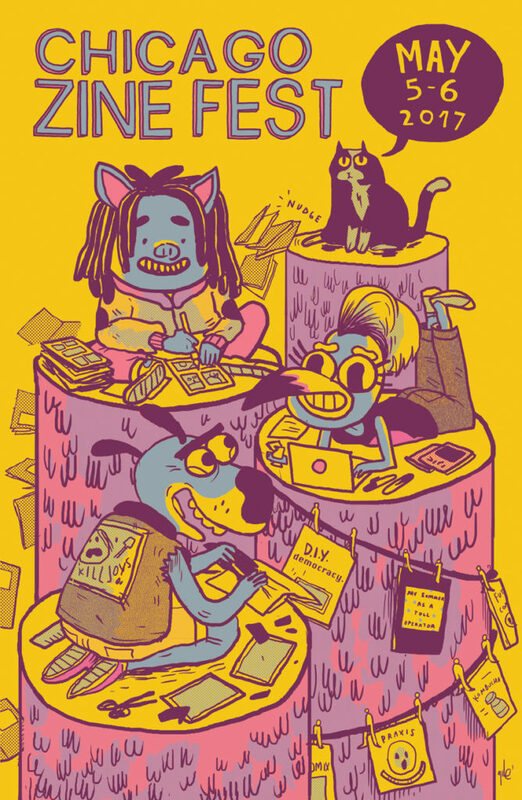 CZF’s mission is to showcase the culture and accessibility of zine-making through workshops, events, and an annual festival that welcomes artists and creators to share their stories, knowledge, and love of zines. The 2017 Chicago Zine Fest is Friday May 5 with the 8th Annual Zine Exhibition on Saturday May 6 at Plumber’s Union Hall. For more information visit chicagozinefest.org. 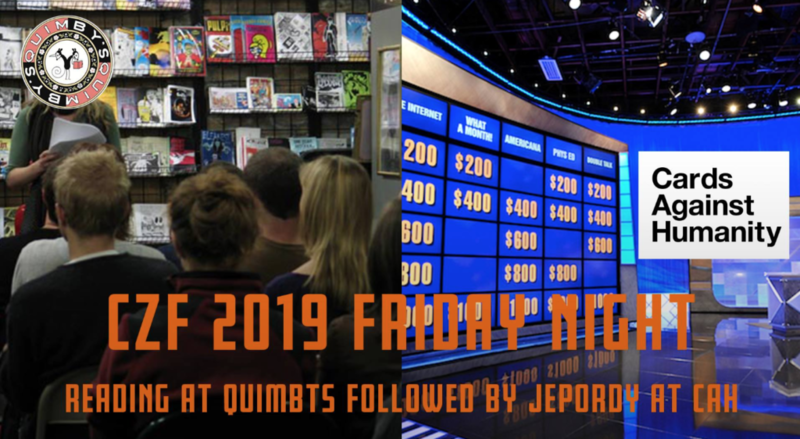 Quimby’s Bookstore is proud to be a sponsor for Chicago Zine Fest. Flyer artwork by Chicago illustrator Chema Skandal. Here’s the Facebook invite for this event. Tell yr friends! Tags: Beauty Bar, Chicago Zine Fest, CZF, karaoke. Offsite: Chicago Zine Fest 2017! Quimby’s is proud to be a co-sponsor of the Chicago Zine Fest, a celebration of small press and independent publishers, with free workshops, events, and an annual festival. The next CZF will be held May 5th-6th, 2017. 6:30pm: “Tools of Survival: Using Zines for Self-Care Panel” moderated by School of Life Design co-founder Kelly Cree. With JC, Rinko Endo, and Kevin Budnik. Panel sponsored by The University of Chicago Library. 8pm: Exhibitor Readings, featuring zinesters & comics artists Natasha Hernandez, Bianca Xunise, Aus & Lauren, Eryca Sender, Sage Coffey, Javier Suarez + Cameron Del Rosario, Fiona Avocado, and Jim Joyce. 11am-6pm: Zine Exhibition – Quimby’s will have a table, yes! Here’s the list of other exhibitors, sponsors, and guests! Here’s a list of other workshops etc during the fest! 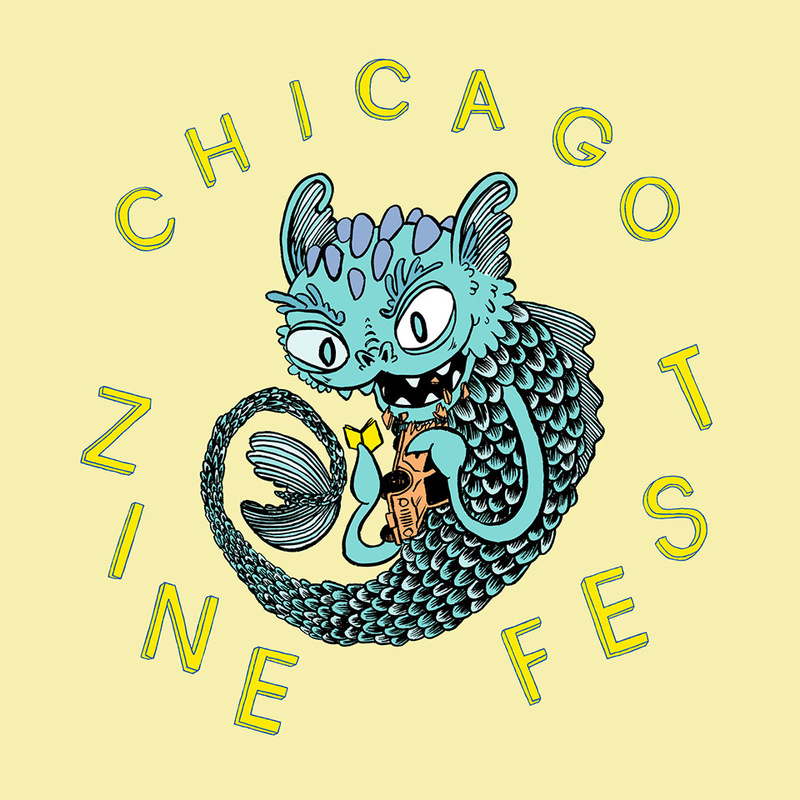 You can support the Chicago Zine Fest by donating through Paypal, contacting them about an in-kind donation, or volunteering! Art by Quimby’s employee Mike Centeno! Tags: Chicago Zine Fest, CZF, Mike Centeno, Quimby's Panel.